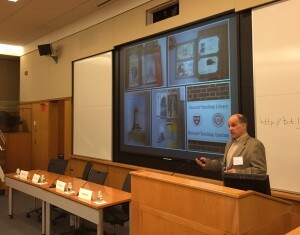 The Easton Library Company project began as an archival project with Associate Professor of English Chris Phillips’ discovery of a set of 18th century library ledgers at the Easton Area Public Library. 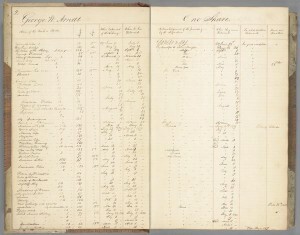 The ledgers held the detailed records of the patrons of the Easton Library Company, the town’s original subscription library, and presented a bevy of data regarding the reading habits, community relationships, and family structures of Easton society. Yet this information was contained in fragile, aging ledger books accessible only to local residents. Phillips, in collaboration with Digital Scholarship Services, began the enormous task of digitizing and transcribing these records with the help of a team of Excel Scholars: Gavin Jones ’14, Elena Principato ’15, Julia Campbell ’15, Cat Miller ’16, Eric Bockol ’16, Venita O’Hanlon ’16, and Sean Cavanagh ’16. Their hard work in deciphering 18th century librarian short hand and in researching local history forms the backbone of this project. The long hours of work and analysis has now culminated in the launch of the Easton Library Company Database. 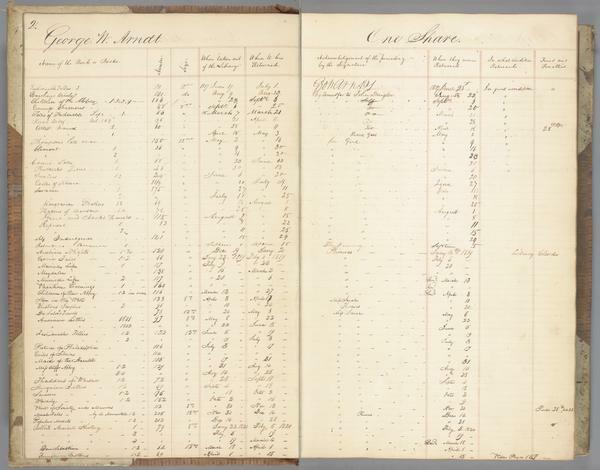 Users can now browse through the ledgers digitized in high-resolution images and explore the reading habits of some of Easton’s most influential residents. The page images are linked to transcriptions that users can read alongside of the original page views. The information collected from these transcriptions forms the basis for the database. Visitors can also sort the contents of the database through a number of facets including book title, author name, and borrower name allowing a user to see who see who read a particular book, or all the books a particular person read. These same facets can be used to create visualizations of the data that reveal the patterns of reading and lending, and eventually the connections between community members. 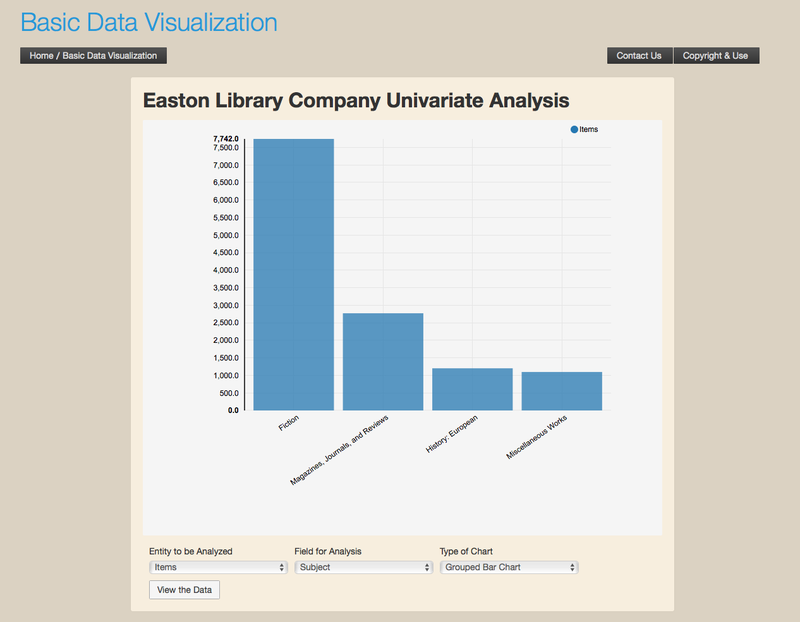 As more information is added to the database these visualizations will give users a glimpse into the social fabric of early Easton. To create these tools and visualizations, DSS has made major improvements to the methods for entering new information into the database. Streamlining and refining the entry forms allows for easier data collection, and most importantly, they help to ensure the accuracy and standardization of new information, which then provides for better search results for the user. 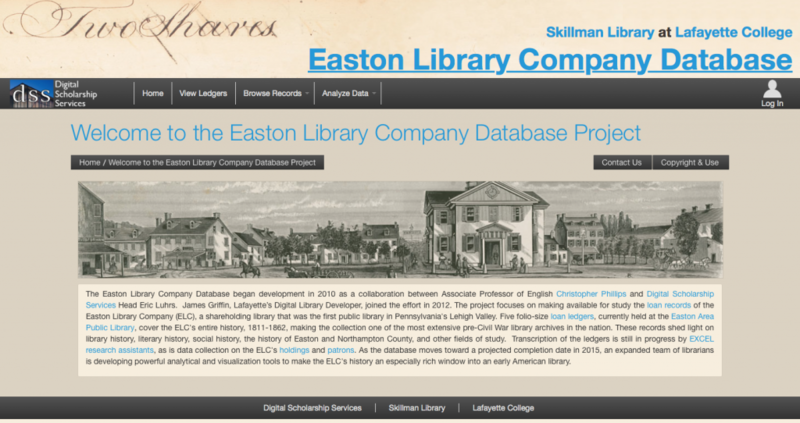 The Easton Library Company Database is continually evolving and new data and new features will continue to be added to the site alongside of new research and information about the collection as it becomes available. Explore the project at elc.lafayette.edu. For more information on starting a digital project with DSS or applying for an internship opportunity contact us at digital@lafayette.edu , or call (610) 330-5796. 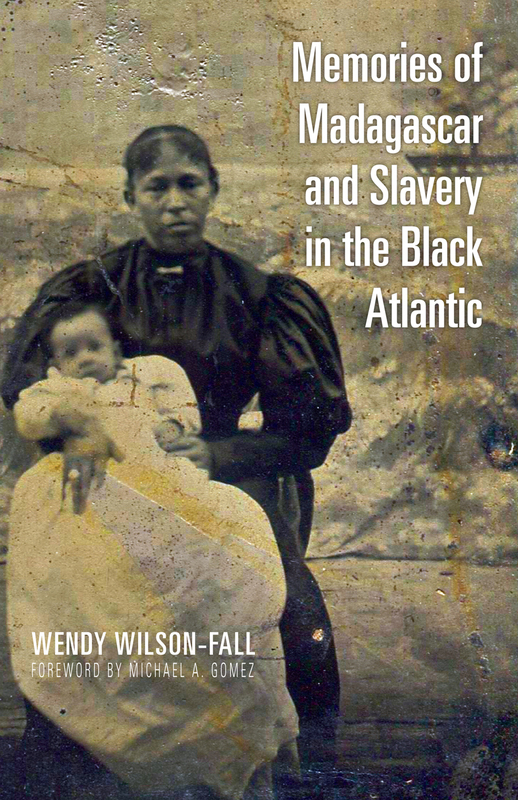 Associate Professor and Chair of Africana Studies, Wendy Wilson-Fall’s latest book Memories of Madagascar and Slavery in the Black Atlantic has just been released from the University of Ohio Press. The book takes an interdisciplinary approach in examining family narratives in which descendants describe their Malagasy lineage as part of their identity. The focus is not only on the narrative itself as text, but on the ways that Malagasy ancestry is remembered in contrast to other forgotten or less visible stories of African descent. Narratives are also contrasted with archival materials, providing historical context and at times, historical evidence. For descendants of slaves, given the fracturing of family networks under the conditions of slavery and the erasure of nation, language, and culture that occurred during enslavement, these stories often only remain in fragments, whispers of an ancestor from Madagascar, or a brief mention of heritage or descent in a document. The research also explores the stories of non-slave Malagasy immigrants of the early to mid-nineteenth century, especially sailors and merchants. In conjunction with the release of this new title, DSS is proud to announce the Mapping Memories of Madagascar digital project. 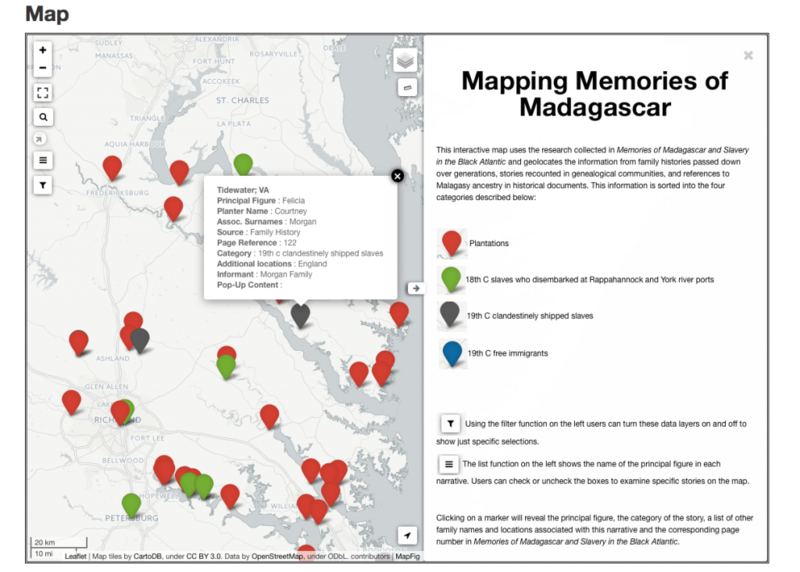 Through this crowd-sourcing project, visitors can use the interactive map to explore the stories told in the book and trace the history of Malagasy presence in the United States in the slavery era. We invite users to submit their own story for future inclusion on the interactive map. Participants may be descendants of slaves, slave owners, merchants or others such as members of former Yankee sailor families who have ties to the western Indian Ocean. All of these contributors are welcome as the goal of the project is to identify the potential connections between these communities and retrace the steps of an often forgotten history. Even these small fragments can add up to new information and insight. Professor Wilson Fall’s work in this area of study is ongoing. Her most recent developments have come from her work with Excel student Clara Randimbiarimanana, ’18 that follows the copal trade, a commodity closely linked to Madagascar, and the pepper trade. Investigating these trade routes has led to new information connections that adds new family connections to a growing network. We look forward to watching this project grow organically through user contributions that will, in turn, open new research questions and uncover new histories. 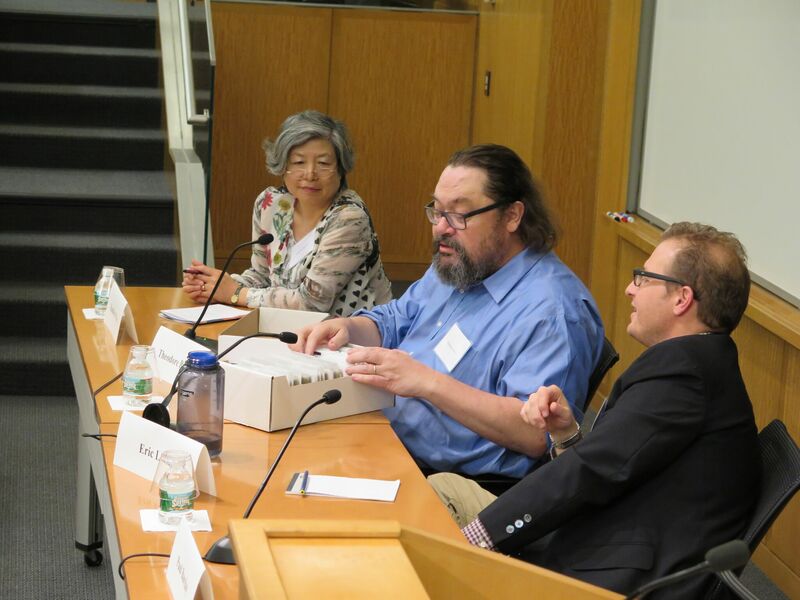 History Professor Paul Barclay and Director of Digital Scholarship Services Eric Luhrs were invited to participate in a workshop on “Advancing Digital Scholarship in Japanese Studies” at the prestigious Reischauer Institute of Japanese Studies at Harvard University. 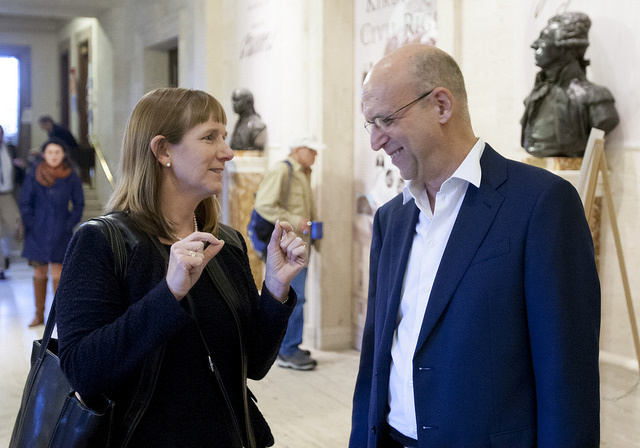 Their flagship digital project, the East Asia Image Collection, served as a catalyst for discussion and as an inspiration for new digital scholarship in the field. The impetus for the invitation was Harvard Yenching Library’s newly acquired collection of ephemera, books, and manuscripts for Japanese-governed Manchukuo (“Manchuria”). Manchukuo, a region that consisted of China’s three northeastern provinces, existed as a state from 1932-1945 and was considered the jewel in the crown of Japanese empire. 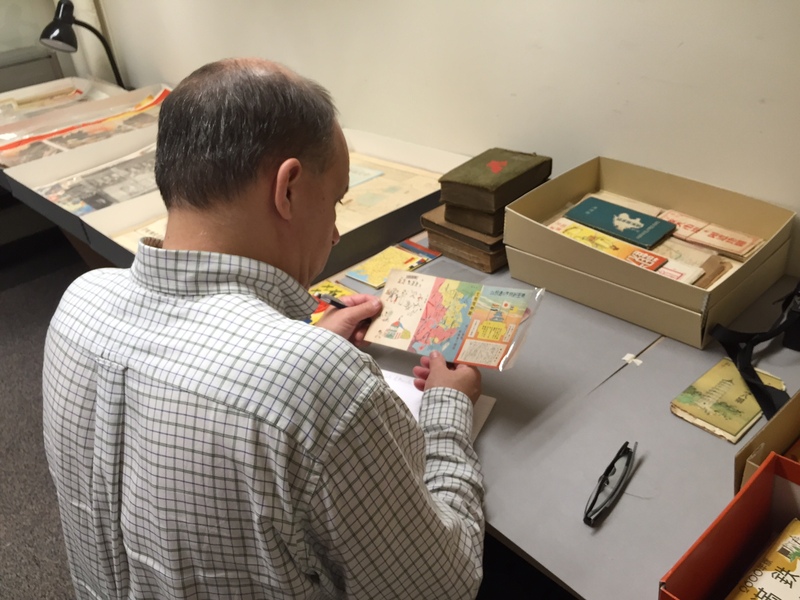 The new collection includes over 2000 items, including hundreds of postcards, board games, propaganda posters, scrapbooks, and hundreds of rare books. Barclay and Luhrs were asked to help survey the materials due to their expertise with similar materials in the EAIC. Their ten years of experience in collecting, cataloging, and building the East Asia Image Collection, an open access archive of almost 6000 postcards and historical ephemera from the Japanese Empire, have made Luhrs and Barclay a valuable resource in this scholarly arena. In the course of the project they have encountered and overcome numerous complexities in terms of digitization, representation, and managing long-term access and preservation of the digital surrogates. They are well positioned to help others negotiate these hurdles and, more importantly, create the foundations not only to build new archives and collections, but also to connect these collections across institutions. Over the course of two days, Barclay and Luhrs met both with scholars of Japanese Studies and experts in digital scholarship to discuss best practices and strategies in creating digital scholarship projects. 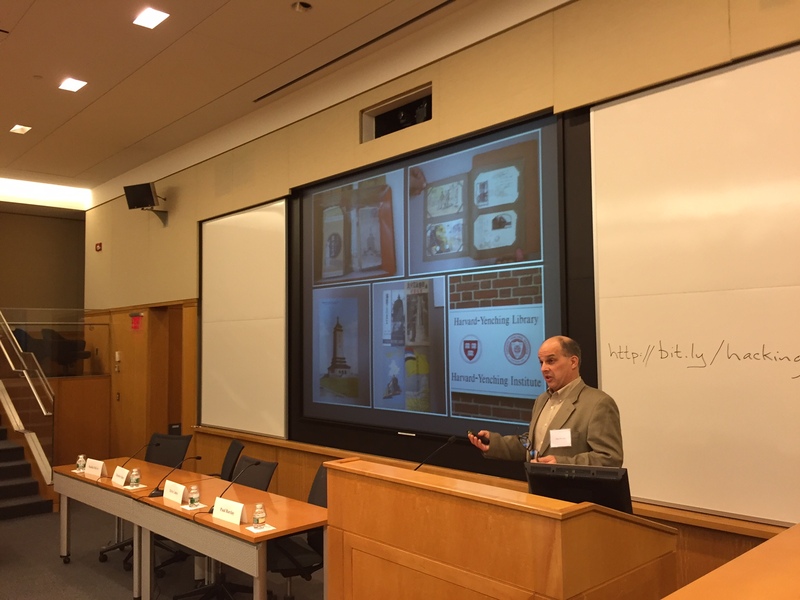 During their presentation, “Growing the East Asia Image Collection over a Decade,” Director Luhrs presented on the technical, conceptual, institutional, and administrative aspects of building a world-class digital archive. Barclay explained how the EAIC has drawn volunteers, students, collaborators, and donors into the project over the years. Barclay focused on three ongoing projects in international collaboration: the Lafayette-Showa Memorial Museum (Tokyo) project to digitize, transcribe, translate, and publish postcard-letters from Japanese families to soldiers in the Philippine Islands in 1945 and 1946; a joint venture between Lafayette and the Puli Municipal Museum in Taiwan to build a digital archive for the Taroko-Japanese War of 1914, and a partnership between Kyoto University and Lafayette College to link digital archives across the Pacific Ocean. Their second session, “From Shoebox to Online Showcase: How to build a Digital Image Collection” included fellow researchers Ted Bestor, Professor of Anthropology and Director of Harvard’s Reischauer Institute, and Kuniko McVey, Librarian of Japanese Language Materials at Yenching. Using Harvard’s new Manchukuo collection as a focus, this session was a round-table discussion of how scholars should (and shouldn’t) build digital research collections. Finally, for the conference’s round-up session, Barclay and Luhrs moderated a discussion among thirty scholars, librarians, and technologists about the future of digital scholarship, copyright issues, and best teaching practices. The focused nature of the conference provided the opportunity for like-minded scholars from a number of prestigious universities and institutions to share resources and solutions. Having the best and brightest of the field assembled in the same location created a unique space for a rich and productive exchange of ideas. Barclay and Luhrs will return to Harvard in May to continue the conversation. The spring session will have a more specific focus on Harvard’s new Manchuria materials and will work to bring together the strengths of scholars and library scientists from multiple institutions in the development of a new research collection. 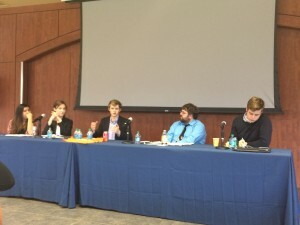 Jethro Israel, Ian Morse, Ben Draves, Vincent DeMarco and Feevan Megersa at the Bucknell Digital Scholarship Conference. 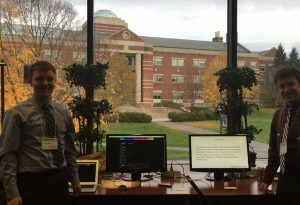 This weekend five Lafayette students presented their work at Bucknell University’s Digital Scholarship Conference, “Collaborating Digitally: Engaging Students in Public Scholarship.” The main focus of the conference was on building new ways to connect Digital Humanities and Digital Scholarship with the student experience and on developing new frameworks for including students as meaningful collaborators on digital projects. While many of the presenters focused on students as researchers or contributors to larger projects, our students presented work of their own design. Feevan Megersa discusses her project on Ethiopian Folktales on a panel presentation. Feevan Megersa ’17, Ian Morse ’17, and Jethro Israel ’16 presented their work on a panel “Models of Student Engagement in DH” alongside of the Library’s Postdoctoral Fellow in Digital Humanities Emily McGinn. Feevan presented her project “Got Folktales?” an interactive project that maps the themes and morals of a collection of Ethiopian folktales, and Ian presented work from his Solution Based Press Freedom Project. 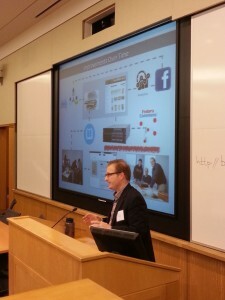 Both projects were developed as part of the Digital Humanities Summer Scholars program. The internship was sponsored by Skillman Library and supported with funding from the Library’s Andrew W. Mellon Grant for Digital Initiatives. Jethro discussed his history with the McDonogh Project, a digital project that tells the story of Washington Watts McDonogh and David Kinney McDonogh, two emancipated slaves who were educated at Lafayette in the 1830s. 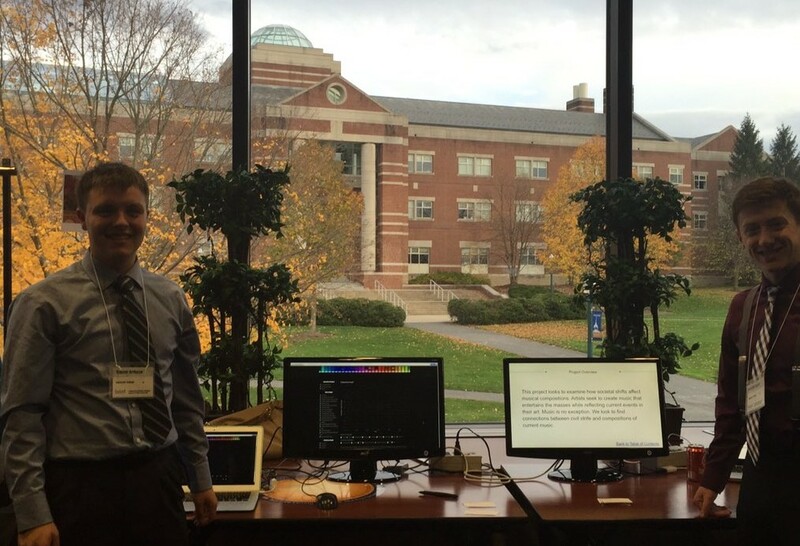 Jethro described his trajectory as he moved from a student working on a class project, to an EXCEL scholar creating and managing the data behind the digital exhibit, to developing his own research interests in relation to the larger project. Vincent DeMarco ’18 and Ben Draves ’17 were a part of their own separate panel where they presented their project Tempo of the Times, a data analysis project also developed in the Summer Scholars program that examines key features of popular music including polarity, “hotness” and danceability against economic data over time. They were also asked to present their work during the poster session during which they were able to do live demos of their interactive graphs and predictive models that anticipate future trends in music. Ian Morse was also given a second opportunity to present his work at the conference. He was selected as part of the NextGen Plenary session in which a panel of five early career scholars presented their work to the entire body of conference goers. Ian presented his project that used large scale text analysis to investigate press freedom violations surrounding Turkey’s Gezi Park protests. His work dovetailed perfectly with keynote speaker Micki Kaufman’s methods on text analysis on Henry Kissinger’s correspondence. Lafayette College was well represented with one of the largest contingents of students, all of whom had produced exceptional work that set the standard for undergraduate research in the digital humanities. 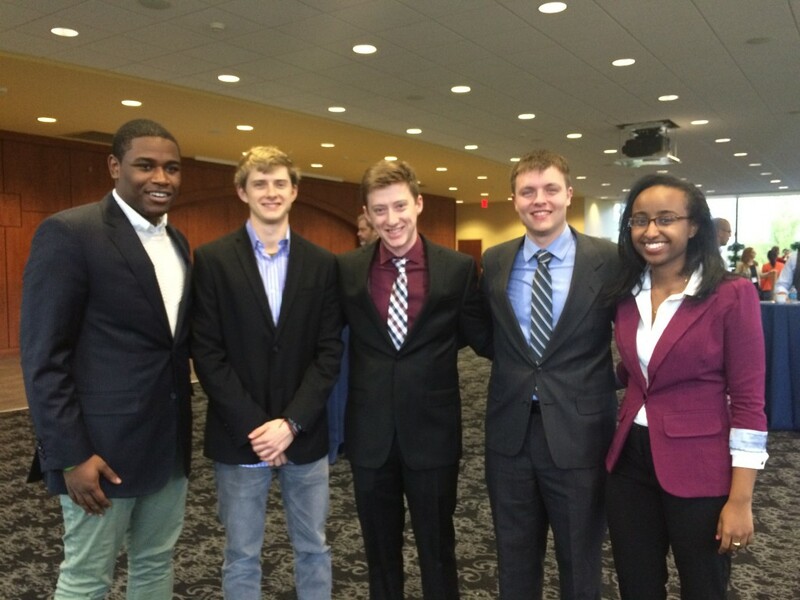 They showed a professionalism and dedication to their work that stands as a testament to the culture of research and intellectual curiosity at Lafayette. During the course of the conference, all of our students became valuable resources for their peers as well as to faculty and administrators hoping to replicate their same success at other institutions. To continue to build a community of practitioners and collaborators here at Lafayette, we will be holding a general interest session Wednesday December 2 in the tech lounge (Pardee 28) from 3-5. Our students will be available to talk more about their projects and are hoping to find students interested in starting their own digital projects and collaborating with them in the future. Drop in anytime between three and five. For more information contact Sarah Morris, Research and Instruction Librarian at morrisse@lafayette.edu. Lafayette College seeks a talented and engaged web programmer to join the Library’s Digital Scholarship Services department. Do you love libraries? Are you passionate about software development? Are you excited by the prospect of designing innovative, elegant interfaces? The person selected for this position will lead design and web programming efforts for Lafayette Library’s digital repository ecosystem. We value and support involvement with digital library development communities and encourage close collaboration locally and across institutions. We seek someone who enjoys autonomy and also thrives as an integral part of a dynamic team that is committed to furthering digital research and scholarship. We invite applications from those who share our perspective, particularly women and people from other under-represented groups. Experience with library-specific technologies such as Omeka and Neatline. If this ad describes you, please send a resume and cover letter explaining your interest and what you can offer our growing development team to: Neil McElroy, Dean of Libraries, Lafayette College, Easton, PA 18042 or via email to: castells@lafayette.edu. The Digital Humanities Steering Committee is pleased to announce its latest call for proposals. View Full Call for Proposals. Please contact Emily McGinn, Postdoctoral Fellow in Digital Humanities (mcginne@lafayette.edu) for consultation before submitting a proposal. To apply for any of these grants, please fill out our online form. Lafayette’s Digital Scholarship Services is once again in the forefront of library repository development. 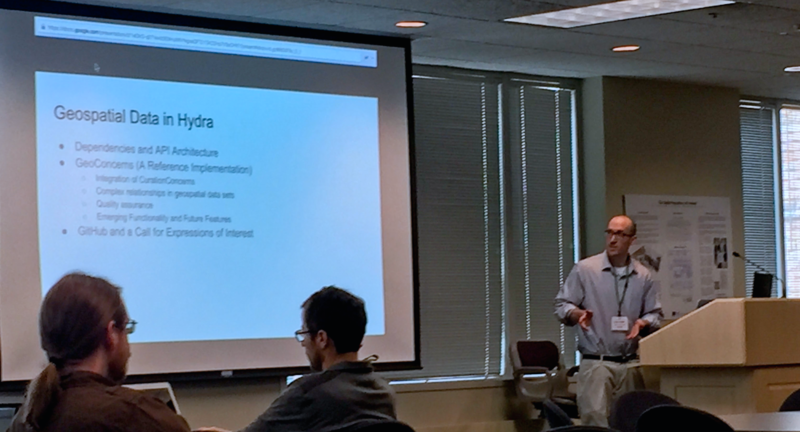 At this year’s HydraConnect Conference, DSS developer James Griffin shared his work with the burgeoning community of Hydra developers. Hydra is an Open Source software that, together with the repository system Fedora, forms the basis of many institutional repositories and is the foundation for preservation and discovery for many digital archives. Griffin is part of a working group looking to expand the uses of Hydra to include the preservation and display of GIS data within library repository systems. While this kind of work is largely invisible to the casual user, it can make a lasting impact on future development. In designing the architecture of this new functionality, Griffin finds himself in excellent company working with a handful of other like-minded developers from Stanford, Princeton, and the University of Alberta, who form the GIS Data Modeling Working Group. The conference provided the occasion for the group to present their initial data models. In these initial stages, the group has begun to break down the complex data components of GIS files into a structure compatible with the repository’s internal organization and consistent with existing data models for other types of information. The group participated in a poster session and also sponsored an “unconference” session, a free form discussion whose topics are determined by the conference goers. 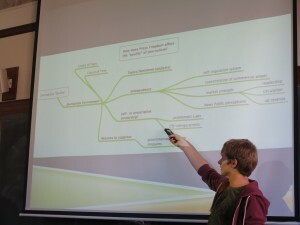 In addition, Griffin presented a lightning talk on their data model. “Our presentations have generated a lot of interest in how we have addressed our use cases using linked open data in the Resource Description Framework,” explains Griffin. “While few are working on GIS related projects our project gives weight to the idea that Hydra is flexible and versatile. It’s more than just a repository solution.” This work, now cutting edge, will help to guide future development in Hydra and expand its potential applications in digital library infrastructure. Through Griffin’s work, Lafayette is an increasingly important player in this arena and the working group will present their latest developments next month at the Digital Library Federation conference in Vancouver, and at the Geo4LibCamp at Stanford University in January. 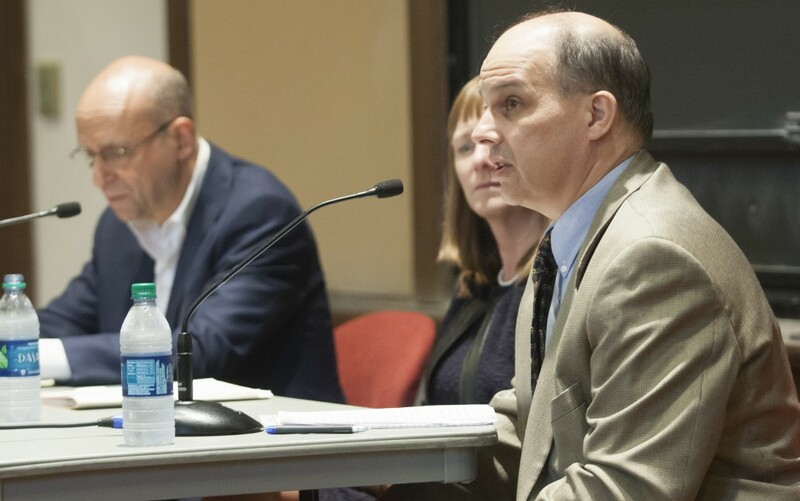 On October 1, President Byerly joined Professor Neil Fraistat, Director of the Maryland Institute for Technology in the Humanities, and Professor Paul Barclay (History, Asian Studies) for a public conversation about Digital Humanities, and more specifically, how DH fits into the liberal arts. The event was sponsored by Skillman Library and the Digital Humanities Steering Committee and is part of an ongoing initiative to enrich digital scholarship on campus. With the benefit of a $700,000, four-year grant from the Andrew W. Mellon Foundation, the Steering Committee has launched a number of new initiatives on campus, including the DH Summer Scholars internship and DH in the Classroom program. These initiatives are in addition to their continued support of large-scale faculty research projects. The broad spectrum of these programs reveals the Committee’s goals of creating a holistic approach to Digital Scholarship that fosters collaboration across disciplines through project-based learning. In addition, these programs work to build a reciprocal relationship between teaching and research in which digital methods open new research questions while transforming the nature of engagement with humanistic objects of study for both students and faculty. Professor Fraistat joined us to discuss the future of these initiatives as we work to strengthen digital engagement with research and the curriculum. 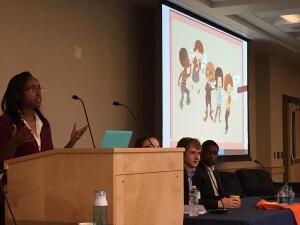 The event prompted an energizing conversation that elucidated the shared goals of the college, the steering committee, and the field of Digital Humanities. We have included here the full transcript of Professor Barclay’s opening remarks and we look forward to continuing this conversation with the Lafayette community. There is a lot more to Google Maps than meets the eye. Join John Clark, DSS’ Data Visualization & GIS Librarian, for a glimpse of what goes on “under the hood” of this online mapping resource and how you can use it to make your own customized maps. 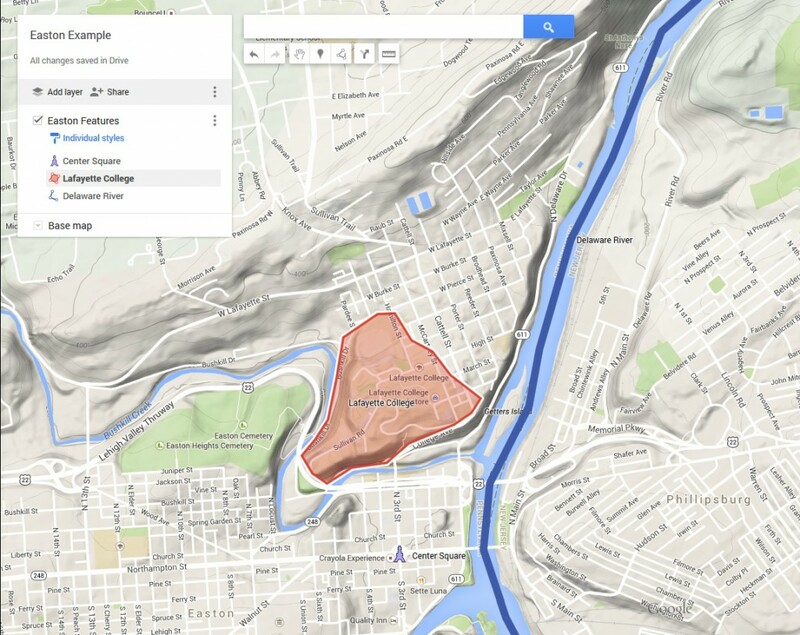 Participants will learn how to contribute their own content to a Google Map as well as many other tips and tricks for creating useful and well designed maps with nothing more than a web browser. Windows laptops will be provided for all participants, but feel free to bring your own. This workshop will be held twice, first on October 16 and then repeated on October 21. Lunch provided. Please RSVP John Clark (clarkjh@lafayette.edu), indicating the date you would like to attend. 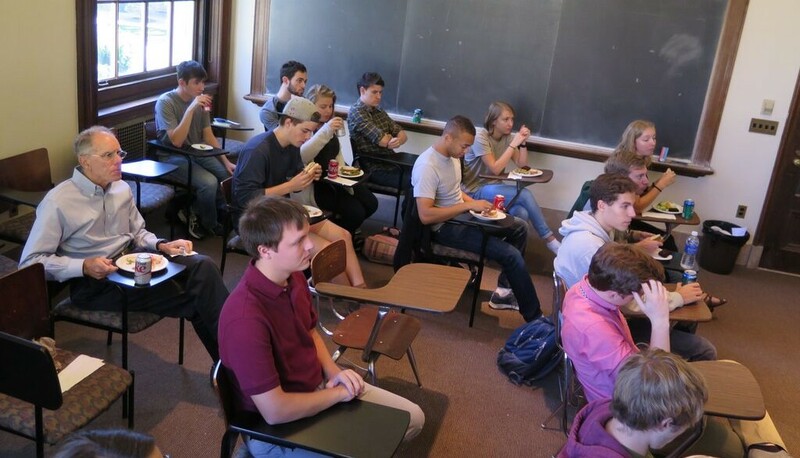 Fifteen students and six faculty and administration members of the DH Mellon Steering Committee gathered for presentations of digital humanities research projects on September 23, 2015, in Kirby 107 as the first of the monthly DH Lunch series of the year. The research grew out of the Digital Humanities Summer Scholars Program funded by the Steering Committee and launched in the summer of 2015. Mellon Foundation Fellow Emily McGinn coordinated the summer research program, and facilitated discussion at today’s event. First up were Vincent DeMarco and Benjamin Draves. Their project, Tempo of the Times, began with a family conversation about depression-era films and how popular arts reflect their historical contexts. To extend this inquiry into the realm of popular music, DeMarco and Draves searched for existing databases of music and ways to break songs down into measurable components. They located several massive datasets, adapted the variables and quantifiers to their own questions, and then went to work. Their current site, as they explained with interactive graphs, presents correlations of economic indicators such as GDP, political indicators such as levels of military spending, with musical variables such as “acousticness” or “loudness” to determine which types of music thrive under what types of epochs. Ian Morse gave the second presentation. His project is the Solution Based Press Freedom Project. 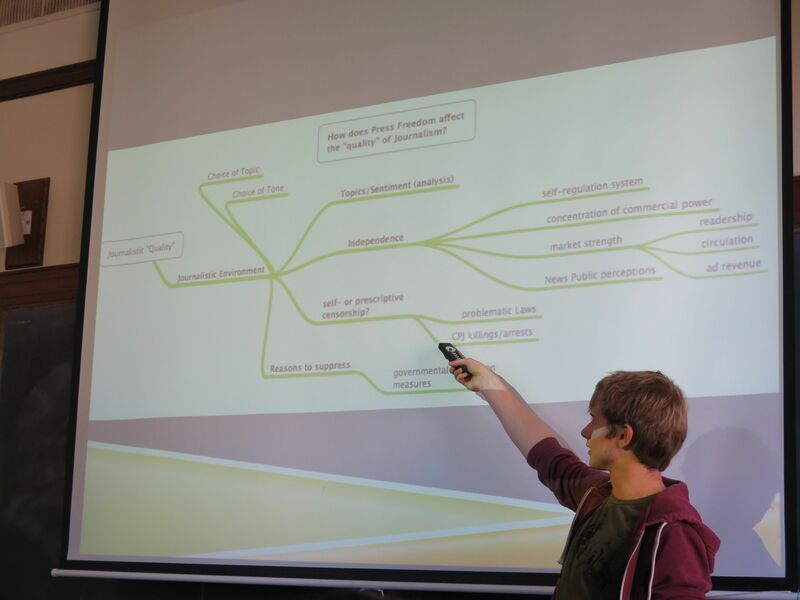 Ian recently studied abroad in Turkey, and his project is an attempt to use a corpus-based methodology to analyze the content of Turkish journalism. Morse mentioned that many global press-freedom indexes fail to control for such variables such as national development, and pay insufficient attention to the quality and tone of reporting as it is affected by political upheavals. Morse has been converting newspaper data to machine readable text, and then using a variety of digital humanities tools find patterns in the data. One of Morse’s next moves is to present his data and preliminary findings to experts on Turkish politics and journalism at a conference at the Bucknell Digital Scholarship Conference “Collaborating Digitally: Engaging Students in Public Scholarship” in November of this year. DeMarco and Draves will also be on the program, as well as other DH summer fellows Feevan Megersa and EXCEL student Jethro Israel. Dean of Libraries Neil McElroy, Professors Wendy Wilson-Fall (Africana Studies), Tim Laquintano (English), Ben Cohen (Engineering Studies), Paul Barclay (History), and Jessica Carr (Religious Studies), as well as Research Librarian Sarah Morris, were also in attendance to ask questions and participate in the discussion. The next DHLaf Lunch will be on October 29th in Skillman 003 from 12-1 and will feature a discussion of History Professor Paul Barclay’s recent work in connecting his East Asia Image Collection with a complementary collection at Kyoto University in Japan.